The first edition of BeyondRCT in 2016 carried the subtitle towards citizen-driven research strategies in food and health. It was organised on 21 March 2016, in Amsterdam by the Dutch TNO research institute, and the Dutch patient organisations Inspire2Live and Platform Patients and Food. They decided to join efforts to push science forward by empowering citizen knowledge and experience on food and health. The motto: How do we enlarge the research potential? The symposium had a very interactive and action-driven set-up. Plenary morning presentations of global top researchers and patients, were followed by a number of interactive sessions to answer the core question: How do we foster new research strategies that include the interest of patients, serve the standards of science and help to strengthen business? 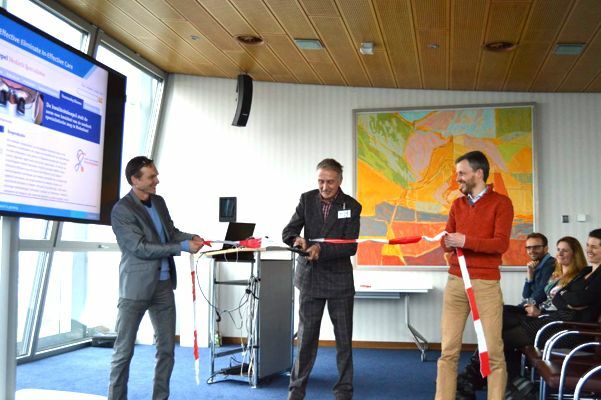 At the Beyond RCT 2016 symposium, Henk Smid, director of ZonMw, symbolically opened the gates for a new generation of citizen-driven research strategies in food and health. On the left, symposium lead Dr. Gaston Remmers, on the right co-organizer Dr. Herman van Wietmarschen.